Every once in a while I like to go through and showcase some of the new products that have been added to the website, just in case anyone has missed something. We have some fun and exciting new things to show you; some great products that could be either great ways to get new business for your company, or just things that would be a fun way to pass the time on a rainy Sunday afternoon. The first category of new items, as our graphic shows, is the Pretty Twisted Craft Kits that were added in 2018. 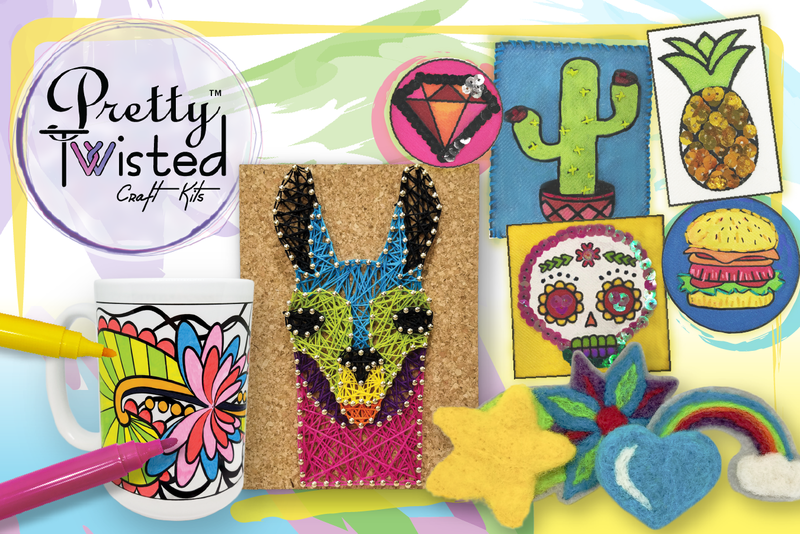 We added three fabulous new string art kits, Dancing Dragonfly, Senorita Sugar Skull and No Drama Llama. We also added Color Your Own Mug kits, giving you the opportunity to decorate a mug that has been sublimated with an abstract design. If fashion is your thing, you might find our Decorate Your Own Patch Kits interesting. These kits combine pre-made patches and pins with patches you can decorate yourself, and also give you supplies to do the decorating. All the Pretty Twisted Kits are designed to be fast and fun, most can be done in a few hours, even if you’ve never done a craft kit before. Another fun crafting product we’ve developed is the Felting Fun Needle Felting Starter Kit. If you’re familiar with needle felting, this kit should be perfect for you. It comes with everything you need to create a needle felted project, including 10 colors of wool, but leaves the design to your own imagination. Felt a purse, felt an animal, felt whatever you like, it’s up to you. For those who machine embroider, the new blankets and scarves we’re stocking would be the perfect addition. From fleece (perfect for tailgating before the big game) to minky (soft as a kiss, and in baby and throw size) to scarves to keep you warm on a cold winter day, our blanket blanks are just waiting for monograms and team logos. The fleece blankets would be great for team booster sales. The minky blankets, especially the baby blankets, would be adorable when paired with a Cubbie for a lovely new baby gift. Speaking of Cubbies, if you’re a quilter, you might find our Quilt-A-Cubbies intriguing. Each Cubbie comes with a specially designed quilt pattern that is suited to the theme of the Cubbie. Perfect for using up scraps that you’ve never been sure what to do with, or for shops that need ideas for how to package and sell remnants and bolt ends, the Quilt-A-Cubbies are both adorable and useful. Finally, don’t miss the new backing we’ve added – R2000. It’s a cutaway that’s perfect for performance wear. If polymesh backing doesn’t work for your production schedule or your pocketbook, R2000 is a less expensive option that can accomplish a lot of the same goals. We brought the backing in after having embroiderers test it and tell us how great it was for performance wear. Since we’ve been selling it, we’ve had even more customers tell us the exact same thing.